Photo: Beasley Centurion 315 (From Reid Technology) Installed May 2006. Note condensation inside glass. The collector shall be made from materials which in their application to the collector shall meet with the requirements of the New Zealand Building Code Approved Document B2. withstand snow loadings likely to be encountered. Collectors shall be capable of withstanding impact by hail up to the sizes commonly encountered at the installation site. Collector insulation shall not absorb moisture. conditions met in normal operation. Nor should they become damaged or degraded under repeated stagnation. shall comply with the requirements of the NZ Building Code, Approved Document G12 and of AS/NZS 4020. Collectors shall be constructed to meet the requirements of Section 4 of AS/NZS 2712. 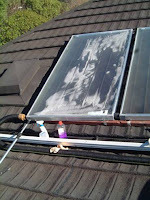 There are numerous examples of solar water heating systems on this website that do comply with AS/NZS 2712. It is time for a rewrite of the Standard and there should be a product recall.